Sterling Silver beautiful Rosary necklace. The Rosary meaning "Rose Garden" is a popular and traditional Catholic devotion. Crafted from sterling silver and accented with a Virgin Mary medal and crucifix, this stunning rosary bead necklace is a masterpiece of traditional inspirational jewelry and modern design. 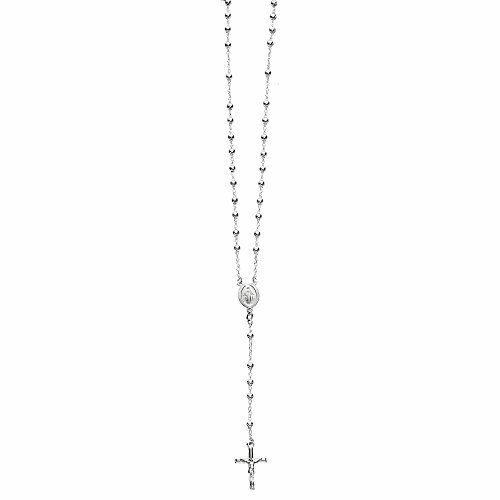 Our silvery rosary necklace is a unique piece that blends the miraculous with the fashion of today. A crucifix necklace couldn't be more in tune with the times. It denotes the prayer beads used to count the series of Prayers that make up the Rosary. Beautifully crafted and well designed in Italy.